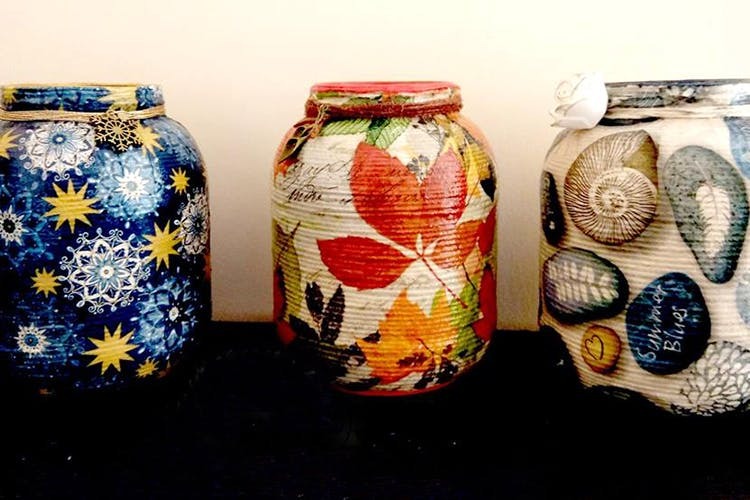 From threaded glass jars to vintage, kitchen accessories — Glad Decor’s custom decoupage creations will surely add charm to your space. After a career in technical writing, when Priti Jain embraced motherhood, she wanted to rediscover her creativity. She began dabbling in decoupage and soon became a hit with her friends and family. So, last year she started Glad Decor and has since worked with a variety of medium, including, wood, wax, plastic, glass, metal and faux leather. We especially heart her threaded glass jars that she decorates with bold floral patterns, ethnic motifs, birds, seashells, and geometrical patterns. Her stencilled blue and white pattern work on tea sets, tissue boxes and kitchen accessories will pretty up your cutlery cupboard, we think. The vintage-esque coasters with colourful cupcakes on them too are worth coveting. Everything that comes from Jain’s Glad Decor is made-to-order. You can send her a query on Facebook and she’ll work with you on the design. And she can decoupage practically everything from pen stands to passport covers, jewellery boxes and even furniture. Prices start at about INR 270 and she’ll source the raw materials as well. Jain conducts workshops too and you can follow her on Facebook for updates.